Karate master Kenyu Chinen, originally from Ie Village, established the World Oshukai Dento Okinawa Shorin-Ryu Karate Do Kobudo Federation. There are branches in numerous countries including France, Poland, Canada, Spain, Italy, India, Belgium, Germany, Switzerland and Slovakia. Although a karate master, Chinen is also known for his artistic talents as a painter. He is currently teaching karate in France. Okinawa is the birthplace of karate. The actual meaning of karate in Japanese is “empty hand.” However, the Okinawans first elaborated “te” (hand), their own unique art of self-defense devoid of weapons, which later developed into karate. Created in the former Ryukyu Kingdom and spread from Okinawa to Japan and then to the world, karate today is said to have more than 50 million fans in more than 140 countries. Karate is characterized by the use of fists, toes, elbows and knife-like hands. It is said that “te” existed before the Chinese styles of kung fu were introduced, flourishing in the 15th century. Cultural exchange with other Asian countries was at its height, and it contributed to the development of karate, with the local art merging with martial arts from other countries, mainly China. At the time when the Satsuma clan (Kagoshima Prefecture) subjugated the Ryukyu Kingdom back in 1609, the Ryukyuans were prohibited from carrying or using weapons; however, they continued karate training in secret. Father and son practiced together in hidden places from midnight to dawn so people would not find out. Between the late 17th and early 18th centuries, “te” and Chinese styles blended together to form a unique martial art: karate. There are two major types of karate: Shuri-te (today, Shorin-ryu) and Naha-te (which later became Goju-ryu). During the 19th century Shuri-te and Naha-te developed into unique forms with different basic movements and methods of breathing. Shuri-te stems from certain training forms linked to natural movement. Stepping is generally in a straight line. Speed and proper timing are essential in the training for kicking, punching and striking. Also, breathing naturally is a peculiarity of Shuri-te. In Naha-te, the moves look more like those of animals. Also, compared to Shuri-te, the kata of Naha-te are rhythmical with an artificial way of breathing in accordance with each of the movements. Other styles are Matsubayashi-ryu, a merger between Shuri-te and Tomari-te, Uechi-ryu with strong roots in China, Ryuei-ryu and a few other styles. It is believed that the study of karate was confined to the Ryukyuan samurai class and carried on in the strictest of secrecy. With the end of the Satsuma clan’s occupation, Okinawa was officially recognized as part of Japan in 1872. Karate became more popular when it was introduced as a physical education requirement in the public schools in Okinawa in 1901. One of the greatest masters ever, Anko Itosu, worked on introducing karate into the schools and thus made one of the most significant contributions to transforming the feudalistic karate into a modern martial art. Itosu also trained many in karate, including Gichin Funakoshi, who, among others, went to mainland Japan in the 1920s to introduce karate there. This marked the beginning of the spread of this martial art throughout the world. Karate was officially adopted by the Nippon Butoku Kai in 1931, and the name “karate” was officially chosen circa 1936. Karate survived the holocaust of World War II and emerged to become international in scope. It regenerated and strengthened to take an equal position among international sports such as boxing, wrestling, judo and aikido. After World War II, the US administration in Japan issued an order prohibiting the practice of judo and kendo, but karate training was permitted. The fact that it could be practiced without any implements helped karate gain in popularity. Later, the development of the karate tournament and “kumite match” was another factor that explains the increase in popularity of karate. The All-Japan Karate-do Championship Tournament was held in Tokyo in 1963, with many teams and individuals competing. Considered its soul, the kata of karate can be described as a systematically organized series of defensive and offensive techniques performed in a sequence against one or more imaginary opponents and are usually given a symmetrical, linear pattern. It includes all the techniques of karate like punching, blocking, striking, kicking and even throwing. These defensive and offensive techniques are combined in kata. There are more than 40 kata divided into basic and intermediate levels. But all are combined to produce the vital power of karate. An interesting fact is that while Ryukyuan dances and karate are different, they have many common characteristics in the movement of the feet and hands, so much so that some believe karate was hidden in folk dances at one time. Some believe this is the link to self-defense. Okinawans strongly believe that kata are the essence of this martial art of self-defense, wherein lies all its richness, in one word, its treasure. The other famous side of karate is kumite, or sparring. While kumite is practiced regularly in karate gyms, sport kumite has become quite popular worldwide. In such practice, opponents are required to seek the opportunity to attack from every angle and in every possible way. Ideally, kumite should be practiced as a life-or-death match, but never with the intention of harming the fellow practitioner. Kumite is a unique act of sharing, for your opponent and you are reaching out together toward the total commitment of self and toward the understanding of that commitment. Along with karate, kobudo, or weaponry, was also developed through the use of various everyday tools. It developed as an art of self-defense when Okinawa was under subjugation and weapons were not permitted. Today, karate and kobudo in Okinawa are considered like the two wheels of a bicycle and thus inseparable. Among the kobudo weapons are the bo (staff), sai (trident), nunchaku (originally a horse bit), eku (oar), tonfa (grinder handle) and many more. 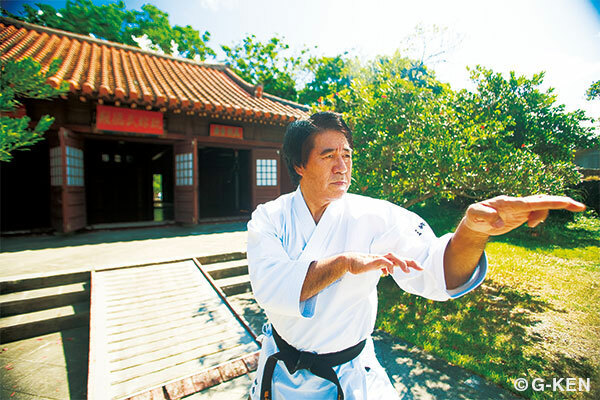 Away from sport-oriented karate, Okinawans are proud of their original karate and kobudo, traditional martial arts that have spread to the world. And with more than 400 dojo on the island of Okinawa, the art is still very much alive and continues to lead the path of the empty hand, karate-do. Murasaki Mura, located in Yomitan Village, is home to the International Karate Study Center, where visitors can try their empty hand at karate. Beginners’ classes are available in both Japanese and English. Classes run for one hour in length with an option for extended sessions possible. Experienced Okinawan karate in France and came to Okinawa in 1993. Charmed by Okinawa, he lives and works today in Naha City and is the editor of the monthly Okinawa Karate News. It would be a pity not to experience the martial art and cultural asset that is karate while visiting Okinawa, the birthplace of karate. Regardless of whether you’re an experienced martial artist or a beginner, many dojo on island will welcome you and show you the way of karate and kobudo. The Okinawa Traditional Karate Liaison Bureau is a local organization that acts as an intermediary between those who want to practice karate and the masters on the island. If you are interested in finding a dojo or a master, or simply want to watch a karate class, visit their website: www.okkb.org.